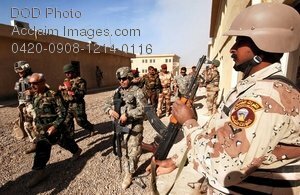 Description: Free, public domain image: Iraqi Army General Walking with Aids. Iraqi army Gen. Babakir Alzbry leaves a meeting and walks to a UH-64 Black Hawk helicopter in Mahmudiyah, Iraq, Nov. 29, 2007. (U.S. Army photo by Spc. Luke Thornberry) (Released.